The Audio Engineering Society Educational Foundation (AESEF) has announced the establishment of the Larry Estrin AESEF Scholarship Fund honoring the legacy of Laurence H. “Larry” Estrin, a respected pro audio industry innovator who introduced numerous engineering advancements in wireless RF technology, broadcast production and live sound. 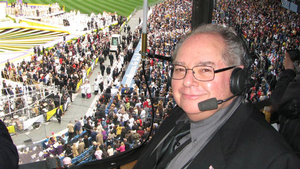 Estrin founded event production firm Best Audio, co-founded Hollywood Sound Systems, was a consultant for many top industry companies and coordinated the audio production for the Olympics, the Super Bowl and dozens of high-profile events and installations. Estrin was a long-time AES member who began his audio career as Don Ho’s road manager in the 1960s. He went on to run Hollywood Sound and The Filmways Audio Group before founding Best Audio in the 1980s and did consulting work for Audio-Technica, Bose Corporation, JBL Professional, Shure, Yamaha of America and others. Estrin handled the first-ever multi-satellite concert broadcast, Elvis’ 1972 TV special Aloha From Hawaii Via Satellite, pioneered the use of wireless mics on NFL referees in 1974 and coordinated the first stereo broadcasts of the Academy Awards and the GRAMMY® Awards. In 1976 he initiated the use of rolling audio speaker carts to streamline production at the Super Bowl. Estrin developed the first remote audio mobile unit designed exclusively for television production. His numerous additional engineering innovations include establishing the standards for the dual/redundant/diverse path physical backbone wired and wireless communications in support of events such as the Olympics opening and closing ceremonies, the U.S. presidential debates and many other global events. Estrin was awarded the Certificate of Esteem from the Department of Defense, the Armed Forces Civilian Service Medal, the Industrial Show Sound Designer of the Year Award, a Platinum record from The Recording Academy® and many additional accolades. He has more than 1,000 TV and film credits. The Audio Engineering Society Educational Foundation, through efforts like the Larry Estrin AESEF Scholarship Fund, is dedicated to encouraging the entry of talented students into the profession of audio engineering. Since its establishment in 1984, the Foundation has awarded grants for graduate studies to hundreds of exceptional applicants worldwide, many of whom have gone on to prominent and successful careers in the industry. The Larry Estrin AESEF Scholarship Fund will be offered annually in the amount of $5,000. Graduate students who are AES members may apply, with preference given to those with a demonstrated commitment to audio engineering in the broadcast industry or related field with advanced studies in RF technology or communications and broadcast production. For more on the AES Education Foundation, visit aes.org/education/foundation/. To donate to the Larry Estrin Scholarship fund, visit secure.aes.org/donations/?typeID=11.